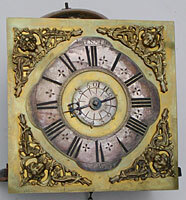 William Barnard is a name well known amongst students of Nottinghamshire clockmaking. He was born in Newark, one source says 1707, another about 1710, the son of another William Barnard, and served a seven-year apprenticeship from 1724 under a young master, Daniel Tantum of Nottingham, a member of another well-known clockmaking family and himself only twenty-four years old. In fact with a little research I discovered that William was baptised at Newark 10th June 1708, making him sixteen years old when apprenticed, two years older than was normal. Barnard would have ended his term of service about 1731, aged twenty three. In 1732 Daniel Tantum moved to Derby to take over his father's business there. It appears to have been at this time, about 1732, that Barnard moved back to his native town of Newark. It seems that William kept up his connection with Nottingham for he was married there at St. Nicholas's church on 3rd February 1742 to Mary Wright, though he was stated to be 'of Newark'. Mary must have died as he seems to have married again there on 29th March 1744 to Ruth Jackson, at that time he was again stated to be 'of Newark'. Whether he worked at first for some other clockmaker at Newark, or set up on his own from the start, we do not know. He is said to have been successor there to the business of Nicholas Goddard, who in fact died in 1740, though I know of no actual evidence to support this tradition. From the style of some of his surviving work, I would have thought he was working before 1740 - this present clock being one such example. We do know that he worked in Newark till his death in 1785, a remarkable working life exceeding fifty years, and this may account for the considerable number of his clocks which survive. If he made as many clocks as we know a typical clockmaker was capable of making, some twenty five clocks a year, his output must have exceeded 1250. We know he had several apprentices, some of whom may have also worked on for him for a while a journeymen, and so he may have been capable of an even higher output. These apprentices were Thomas Ingerson, John Crampern, William Lowther, John Barber and Edward Crampton. Of these we know that John Barber became William Barnard's successor, working from about 1786 to 1790. The Cramperns, John, and William who was probably his father, appear to have worked as an independent family concern in the late 1760s to about 1790. William Barnard is one of those interesting clockmakers who numbered their clocks. Like most of them, he did not seem to hit upon this idea immediately he began his career. We know of some of his clocks without any numbers - the hooded clock pictured here for example. The highest numbered clock of his that I know of is number 1216. So it is possible he achieved a higher output than the notional 1250. Barnard himself may have kept, in fact must have kept, a register of his numbering system. If so, this was probably scrapped long ago, as were the ledgers of most clockmakers once they had served their temporary purpose. If it survives, then its whereabouts today are unknown. Many clockmakers are known to have numbered their clocks, and yet such workbooks recording these numbers are very rare. Only two are known to survive at all from British clockmakers (Samuel Roberts of Llanfaircaereinion and Samuel Deacon of Barton in the Beans, Leicestershire). From these we know that clockmakers made virtually all of their clocks for advance orders, which they filled as promptly as they could. Rather than make clocks at random and hope to find a buyer, the average clockmaker made clocks to order. It is likely that all clockmakers kept working note books, detailing orders taken, etc., as well as those mechanical notes they would have to refer to from time to time, such as wheel counts, moon-drive systems, etc. Half a dozen such 'books' are known to survive, but these are really only scrap-books with jottings on odd pages here and there. But it is even more obvious that anyone operating a numbering system must have recorded the sequence quite seriously in a book he kept to hand for some years. I can say from having examined the only two British ones known to exist, that even these are pretty scrappy affairs. Samuel Deacon's in particular has bits of notes jotted down on pages apparently at random, and sometimes he turned the books round to start afresh at a different point. They remind me very much of my own daily jottings pad, with notes from random sources such as phone calls. I can understand it, but anyone else would be able to make little sense of it. Such are Samuel Deacon's note books. 1. The Barnard hooded clock in its simple yet shapely case of oak. Click for closer view. 2. The dial of the clock measures seven and a half inches square. Note the engraving of the signature and the very finely-chiselled hand. Click for closer view. A few of Barnard's early clocks are numbered in a hidden place inside the movement or on the movement backplate - numbers 248 and 384 are examples of that. Oddly no.248 is not signed on the dial, though it is signed behind the dial, and only from this do we recognise the clock as being one of his. How many others may have escaped recognition by being unsigned? No.384 is signed on the dial. The hooded clock pictured here is also signed on the dial but is not numbered anywhere. So clearly his early system was very erratic, perhaps just in his first few years, for the hooded clock must date by its style as amongst his first clocks. I know of clocks numbered 248, 384, 424, 525, 531, 535, 565, 566, 587, 591, 613, 627, 706, 772, 797, 816, 819, 901, 910, 921, 969 (dated 1769), 1005, 1084, 1086, 1099, 1189, 1204, 1207, 1216, and one said to be 1753, which is probably an error for 753. All are longcase clocks except the hooded clock pictured here, which is the only clock of his that I know personally without a number. We are short of recorded numbers in the 200, 300, 400 range. The very few clocks recorded with low numbers could be accounted for by the fact that the numbers were hidden and so not spotted, or by the fact that the clocks were unsigned and therefore not identified as being by him. Most of his longcase clocks seem to have been eight-day examples, though thirty-hour clocks are known. The hooded clocks is a strange little clock, made of course, as thirty-hour hooded wall clocks were, for cheapness. As such this is characteristic of a clockmaker just setting up in business, who needs whatever commissions he can get, the lowly as well as the grand. His later clocks are almost always eight-day ones, which perhaps indicates that by then he is able to concentrate more on items for the upper market. The styling is primitive, yet has enough about it to suggest a period, which seems to me like the early 1730s. The chapter ring is very odd in design, the like of which I have never seen before, with flanges protruding outside the usual circle rim, the upper flange signed BARNARD and the lower one NEWARK. The engraving is neat and interesting but the letters are positioned along nothing like a straight line, and we can see that he has had a real struggle to squeeze in the final K.
I would suspect that William Barnard was not an engraver. The lettering is not well done. Nor is that in the example where his name is signed behind the cartwheel dial of no.248. Did he have this extraordinary chapter ring professionally engraved with the space left blank for him to engrave his own name? If so, it is an odd thing to do - but who knows? The meeting-arrowhead half-hour markers are by now an old-fashioned style, having been used from the 1690s, but they do the job and particularly on a tiny dial such as this (only seven and a half inches square), where space is very limited. The clock pillars are made of iron (for cheapness) and totally without decoration, for the same reason. The three dial feet are also of plain iron rod. We know that he sometimes used iron for the pillars of some of his early longcase clocks - no.384 for example, which is a two-handed thirty-hour clock built using a one-handed chapter ring. Iron was presumably used here again for cheapness, being one tenth of the cost of brass, and his 'making do' with the wrong chapter ring suggests that he was in a hurry to finish the clock without the time to order the right chapter ring, or that he was using whatever was available to hand on what was a cheap job anyway. The dial is very thin and is a solid casting - no chance to use a cartwheel type of casting on such a thin dial, though we know he did on his eight-day clocks. The verge escapement is neat and simply made. The support for the verge pivot has at some time been repaired and as a result the alarm trip has been lowered by about half an inch, leaving two tell-tale holes to mark its original position. The massive bell needs to be this wide to contain the double-headed alarm hammer. It carries a bellfounder's casting imprint, GB beneath a crescent moon. This is believed to have been G. M. Bowen, who was a London bellfounder about 1880, and therefore must be a replacement. All in all this is a delightful little clock, simply made yet strong and sturdy, and of a type which we see precious few of today. Footnote. An article of mine on 'William Barnard and the First Newark Clockmakers', discussing in particular his longcase clocks, appeared in Horological Journal in November 2003. Click here to read the article on-line.